The mitochondrial unfolded protein response (mitoUPR) is a stress response pathway activated by disruption of proteostasis in the mitochondria. This pathway has been proposed to influence lifespan, with studies suggesting that mitoUPR activation has complex effects on longevity. Here, we examined the contribution of the mitoUPR to the survival and lifespan of three long-lived mitochondrial mutants in Caenorhabditis elegans by modulating the levels of ATFS-1, the central transcription factor that mediates the mitoUPR. We found that clk-1, isp-1, and nuo-6 worms all exhibit an ATFS-1-dependent activation of the mitoUPR. While loss of atfs-1 during adulthood does not affect lifespan in any of these strains, absence of atfs-1 during development prevents clk-1 and isp-1 worms from reaching adulthood and reduces the lifespan of nuo-6 mutants. Examining the mechanism by which deletion of atfs-1 reverts nuo-6 lifespan to wild-type, we find that many of the transcriptional changes present in nuo-6 worms are mediated by ATFS-1. Genes exhibiting an ATFS-1-dependent upregulation in nuo-6 worms are enriched for transcripts that function in stress response and metabolism. 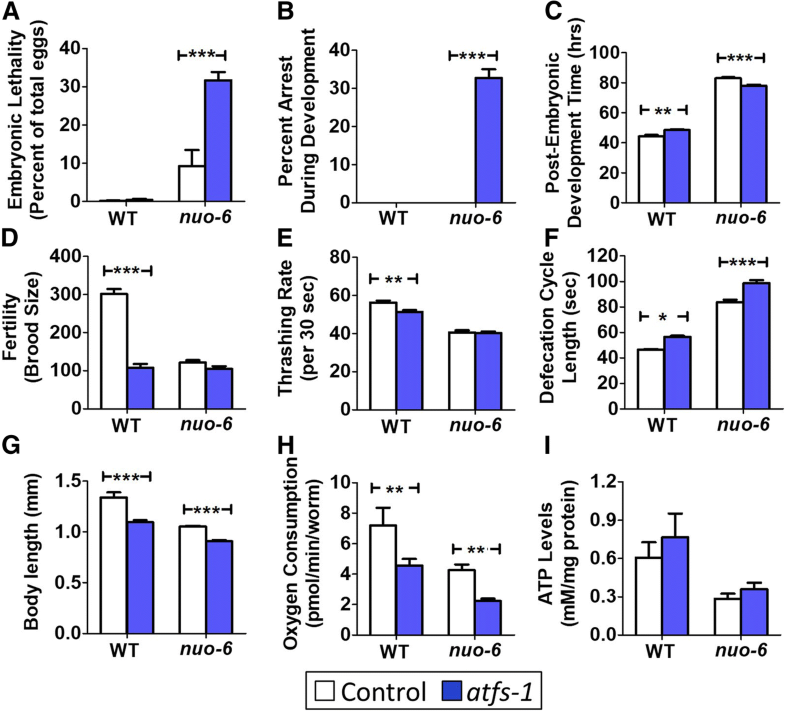 Consistent, with this finding, loss of atfs-1 abolishes the enhanced stress resistance observed in nuo-6 mutants and prevents upregulation of multiple stress response pathways including the HIF-1-mediated hypoxia response, SKN-1-mediated oxidative stress response and DAF-16-mediated stress response. Our results suggest that in the long-lived mitochondrial mutant nuo-6 activation of the mitoUPR causes atfs-1-dependent changes in the expression of genes involved in stress response and metabolism, which contributes to the extended longevity observed in this mutant. This work demonstrates that the mitoUPR can modulate multiple stress response pathways and suggests that it is crucial for the development and lifespan of long-lived mitochondrial mutants. The mitochondrial unfolded protein response (mitoUPR) is a stress response pathway that enables the mitochondria to communicate with the nucleus to upregulate mitochondrial chaperones and alter metabolism in response to mitochondrial stresses [1, 2]. This response is controlled by ATFS-1 (activating transcription factor associated with stress-1) in Caenorhabditis elegans  and ATF5 in mammals . The ATFS-1 protein has both a mitochondria targeting sequence and a nuclear localization signal. Under normal conditions, ATFS-1 is imported into the mitochondria and degraded by the Lon protease . When the mitochondria is stressed (e.g., by exposure to ROS , disrupted stoichiometry of the subunits of the electron transport chain , or mutations affecting mitochondria function ), the import of ATFS-1 into the mitochondria is prevented, allowing ATFS-1 to travel to the nucleus where it upregulates the expression of mitochondrial chaperones, various detoxification enzymes and metabolic enzymes . In addition to ATFS-1, there are multiple other proteins involved in the mitoUPR including the mitochondrial matrix protease ClpP, the mitochondrial matrix peptide exporter HAF-1, the small ubiquitin-like protein, UBL-5, and the transcription factor DVE-1 [8–10]. Under conditions of mitochondrial stress, ClpP cleaves mitochondrial proteins, which are exported by HAF-1. These peptides have been proposed to inhibit the mitochondrial import of ATFS-1 , which accumulates in the cytoplasm and then travels to the nucleus where it acts in a complex with UBL-5 and DVE-1 to mediate the transcriptional changes associated with the mitoUPR. Among other changes, this includes increased expression of mitochondrial chaperone proteins, such as HSP-6, that help to re-establish proteostasis in the mitochondria. Based on the observation that the mitoUPR is activated by knockdown of cytochrome c oxidase-1 (CCO-1)  and the fact that RNAi against cco-1 increases lifespan , a role for the mitoUPR in longevity was explored by knocking down the expression of required components of the mitoUPR in long-lived worms with mildly impaired mitochondrial function. It was found that knocking down the expression of ubl-5 reduces the lifespan of two long-lived mitochondrial mutants called clk-1 and isp-1, but does not affect the lifespan of wild-type worms . Similarly, decreasing the expression of dve-1 reduced isp-1 lifespan, but also markedly decreased wild-type lifespan making this observation more difficult to interpret . It was subsequently shown that knocking down the expression of the mitochondrial ribosomal protein S5 (mrps-5), which causes an imbalance in between nuclear- and mitochondrially encoded components of the electron transport chain, causes both the activation of the mitoUPR and increased lifespan . Importantly, decreasing ubl-5 levels with RNAi reduced the increase in lifespan caused by mrps-5 knockdown . Activation of the mitoUPR has also been implicated in the lifespan extension caused by different types of bacteria  possibly through elevated reactive oxygen species . Combined, these studies suggested that the mitoUPR plays a role in specific longevity pathways. However, a subsequent study has suggested that the relationship between the mitoUPR and longevity is more complicated. After completing an RNAi screen for genes that activate the mitoUPR, it was shown that only some of these genes increase lifespan, while others decrease it . This indicates that activation of the mitoUPR is not sufficient to increase lifespan. It was also shown that RNAi against cco-1 can still increase the lifespan of an atfs-1 deletion mutant (tm4525) even though the atfs-1 mutation prevented the activation of the mitoUPR (as measured with an hsp-6 reporter strain) . Similarly, RNAi against atfs-1 prevented the activation of the mitoUPR in isp-1 mutants but did not impact longevity. Combined, these results suggest that activation of the mitoUPR is not required for longevity that is induced by cco-1 RNAi or isp-1 mutation. Similarly, it was shown that the increase in lifespan resulting from RNAi against a putative cytochrome c oxidase (F29C4.2) was not affected by loss of atfs-1 . Thus, at present, the role of the mitoUPR in determining longevity remains unclear . In this work, we explore the role of the mitoUPR in the lifespan of three long-lived mitochondrial mutants: clk-1, isp-1, and nuo-6 [19–22]. These genes encode proteins involved in the mitochondrial electron transport chain including a hydroxylase required for the synthesis of ubiquinone, a subunit of complex III called the Rieske iron sulfur protein and a subunit of complex I, respectively. In clk-1 and isp-1 mutants, we find that the mitoUPR is not required during adulthood for their long lifespans, but is required for these worms to develop to adulthood, making it impossible to assess its contributions to longevity conclusively. Importantly, nuo-6 worms do not require the mitoUPR to develop to adulthood, thereby providing the opportunity to assess the role of the mitoUPR in longevity. We find that in nuo-6 worms the activation of the mitoUPR causes the upregulation of stress response genes and metabolic enzymes and that this results in increased resistance to multiple stresses and long lifespan. In order to examine the role of the mitoUPR in the long lifespan of the mitochondrial mutants clk-1, isp-1, and nuo-6, we first sought to confirm that the mitoUPR is upregulated in these mutants [6, 12, 23]. To do this, we crossed the mitochondrial mutant strains to a reporter strain for the mitoUPR target gene hsp-6 (Phsp-6::GFP) . We found that clk-1, isp-1, and nuo-6 worms all exhibit increased fluorescence compared to wild-type worms (Fig. 1a) indicating activation of the mitoUPR. We found that fluorescence from the mitoUPR reporter remained significantly increased until day 5 of adulthood (Fig. 1b). Since GFP-tagged proteins can have a half-life of multiple days, it is possible that fluorescence from the mitoUPR reporter strain during adulthood resulted from mitoUPR activity during development. To confirm that the mitoUPR remains activated in adulthood, we examined RNAseq data from clk-1, isp-1, and nuo-6 mutants at the young adult stage . We found that hsp-6 mRNA is significantly increased in all three strains and is correlated with atfs-1 mRNA levels (Additional file 1: Figure S1). Next, we sought to determine whether the mitoUPR is also activated during larval development. We examined worms at 1 and 2 days after hatching and in both cases found that the mitoUPR is activated in clk-1, isp-1, and nuo-6 worms (Fig. 1c, d). Finally, we wanted to determine whether the activation of the mitoUPR is dependent on ATFS-1. Accordingly, we treated clk-1;Phsp-6::GFP, isp-1;Phsp-6::GFP, and nuo-6;Phsp-6::GFP worms with RNAi targeting atfs-1 and found that knocking down atfs-1 prevented the induction of the mitoUPR (Fig. 1e, Additional file 1: Figure S2). Combined, these results demonstrate that the long-lived mitochondrial mutant strains exhibit an ATFS-1 dependent activation of the mitoUPR in development and early adulthood. Since elevated ROS levels are sufficient to activate the mitoUPR [5, 25] and ROS levels have been shown to be increased in the long-lived mitochondrial mutants [26, 27], we next sought to determine the extent to which the activation of the mitoUPR is dependent on elevated ROS. To do this, we treated nuo-6 worms with two different antioxidants, 10 mM vitamin C and 10 mM N-acetyl-cysteine, which have been previously shown to decrease the lifespan of long-lived mitochondrial mutants [26, 28]. Using the Phsp-6::GFP reporter fluorescence as a measurement of mitoUPR activity, we found that antioxidant treatment had no impact on mitoUPR activation (Additional file 1: Figure S3). This suggests that an elevation in ROS is not required for the nuo-6 mutation to activate the mitoUPR. However, it is also possible that the antioxidant treatment did not reduce the levels of ROS sufficiently, or did not reduce the right population of ROS to observe an effect on mitoUPR activation. To elucidate the role of the mitoUPR in the long-lifespan of clk-1, isp-1, and nuo-6 worms, we examined how decreasing atfs-1 expression affected their longevity. We used three different paradigms of increasing severity: atfs-1 RNAi beginning in the experimental L4 generation, atfs-1 RNAi beginning in the parental L4 generation and an atfs-1(gk3094) deletion mutation. In the experimental L4 RNAi paradigm, worms are allowed to develop on NGM plates until the L4 stage of development, when they were transferred to atfs-1 RNAi plates. Using this paradigm, we found that atfs-1 RNAi caused a small decrease in clk-1 lifespan (Fig. 2a), but did not affect the longevity of isp-1 (Fig. 2b) or nuo-6 worms (Fig. 2c). At day 2 of adulthood, this paradigm resulted in a significant decrease in atfs-1 levels as well as the atfs-1 target gene hsp-6 (Fig. 2d), but did not affect the expression of cytosolic unfolded protein response targets hsp-16.11 or hsp-16.2 (which we found are robustly increased by atfs-1 mutation—see Fig. 6). In the parental L4 paradigm, worms are transferred to atfs-1 RNAi plates at the L4 stage. When these worms become gravid adults, they are transferred to a second atfs-1 RNAi plate and allowed to lay eggs for 24 h. The lifespan of the F1 progeny is then measured when the worms reach adulthood. 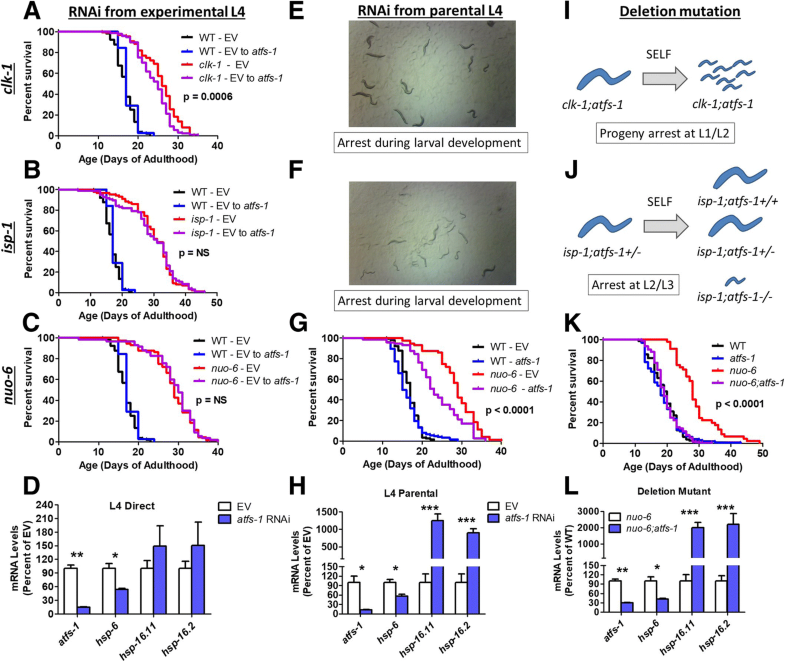 Under this paradigm, we found that only wild-type and nuo-6 worms are able to develop to adulthood, while clk-1 and isp-1 worms arrest during larval development (Fig. 2e, f; Additional file 1: Figures S4, S5), as has been observed previously . 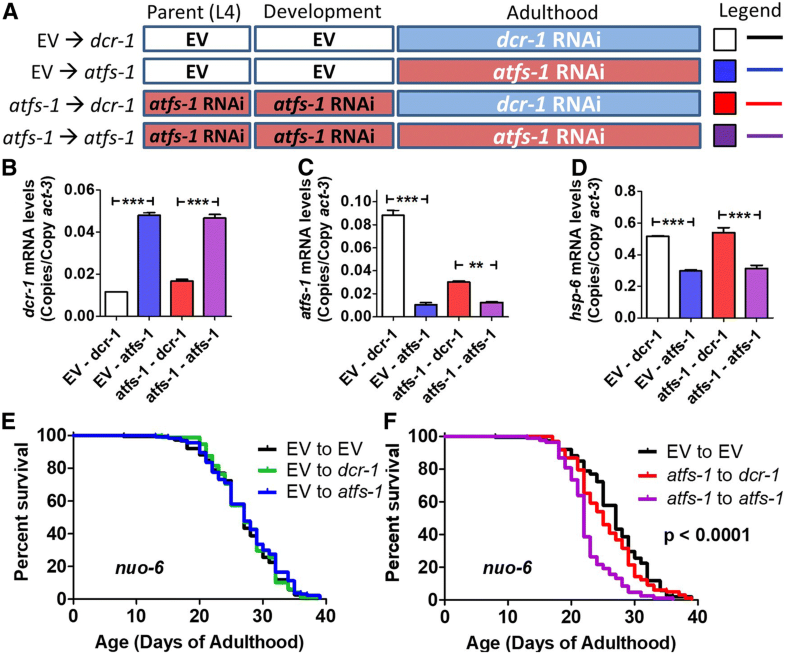 We found that knocking down atfs-1 beginning at the L4 stage in the parental generation significantly decreased nuo-6 lifespan but did not affect wild-type longevity (Fig. 2g). This paradigm significantly reduced the expression levels of atfs-1 and hsp-6 to a similar extent as we observed in the experimental L4 paradigm. Unlike the experimental L4 paradigm, knocking down atfs-1 beginning in the parental generation resulted in a significant increase in the expression of hsp-16.11 and hsp-16.2, which are involved in the cytosolic unfolded protein response (also known as the heat shock response) (Fig. 2h). This suggests that there may be a greater degree of proteotoxic stress when atfs-1 is knocked down in throughout life. Finally, we examined the effect of an atfs-1 deletion mutation on the lifespan of the mitochondrial mutants. We found that clk-1;atfs-1 double mutants produce few progeny and that the progeny arrest at the L1 or L2 stage of development (Fig. 2i). Similarly, we found that isp-1;atfs-1 double mutants arrest at the L2 or L3 stage (Fig. 2j). In contrast, nuo-6;atfs-1 double mutants were found to be viable and fertile. Examining the lifespan of these double mutants revealed that the atfs-1 deletion completely reverted nuo-6 lifespan to wild-type but did not impact wild-type lifespan (Fig. 2k). The atfs-1 deletion reduced expression of atfs-1 and hsp-6 and increased the expression of hsp-16.11 and hsp-16.2 (Fig. 2l). Combined, these results demonstrate that atfs-1 is required for the development of clk-1 and isp-1 worms to adulthood and for the longevity of nuo-6 worms. Loss of atfs-1 does not decrease wild-type lifespan, and in the mitochondrial mutants, atfs-1 is not needed during adulthood for normal lifespan. Because we observed an effect of atfs-1 RNAi on the lifespan of nuo-6 mutants, we decided to examine other components of the mitoUPR including UBL-5, DVE-1 and HAF-1. We used the parental L4 paradigm in which we observed an effect of atfs-1 RNAi in nuo-6 worms. Under these conditions, we found that knocking down dve-1 or ubl-5 prevented nuo-6 worms from developing to adulthood (Additional file 1: Figure S6). Since nuo-6 worms could develop to the L4 stage on ubl-5 RNAi, we compared the survival of these worms to worms grown on empty vector RNAi. Consistent with our observations with atfs-1 RNAi, we found that the L4 survival of nuo-6 worms on ubl-5 RNAi was markedly decreased compared to EV RNAi (Additional file 1: Figure S7A). 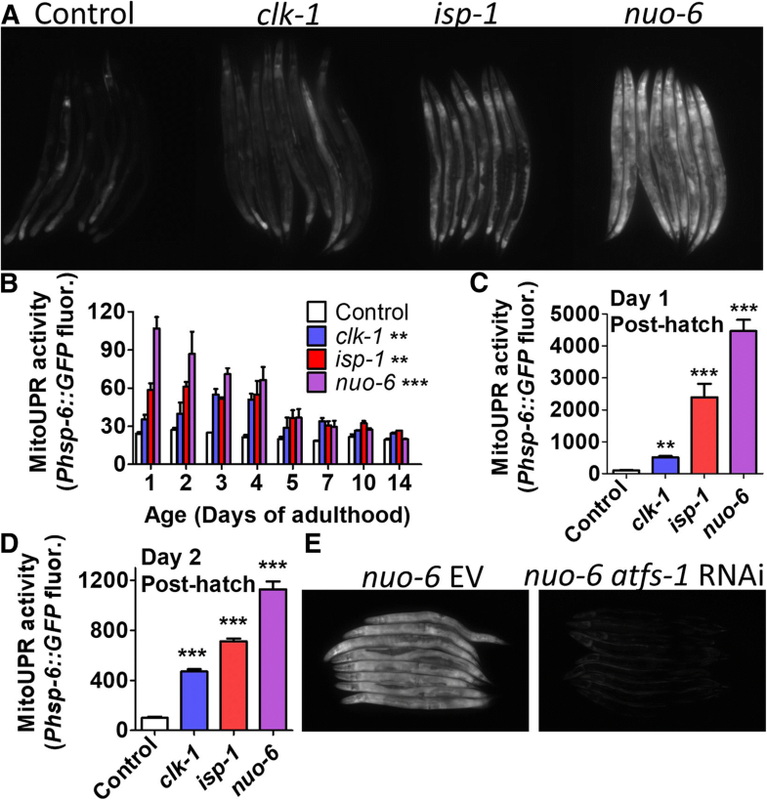 On haf-1 RNAi, nuo-6 worms developed to adulthood and showed a similar lifespan to worms grown on EV RNAi (Additional file 1: Figure S7B). This suggests that the mechanism by which disruption of nuo-6 activates the mitoUPR does not require HAF-1. As with the results of our lifespan studies, we found that haf-1 RNAi had a different effect on activation of the cytosolic unfolded protein response compared to other components of the mitoUPR. While knockdown of atfs-1, ubl-5, or dve-1 resulted in increased expression of the cytosolic unfolded protein response target genes, hsp-16.11 and hsp-16.12, haf-1 RNAi had no significant effect on the expression of either gene (Additional file 1: Figure S8). Again, this suggests that disruption of haf-1 in the mitochondria affects the mitoUPR differently than disruption of the nuclear factors atfs-1, dve-1, and ubl-5. Since deletion of the mitochondrial superoxide dismutase gene sod-2  and mild inhibition of mitochondrial function have both been proposed to increase lifespan through elevation of mitochondrial superoxide levels , we also examined the role of the mitoUPR in the longevity of sod-2 worms. As in the long-lived mitochondrial mutants, we found that the mitoUPR is activated in sod-2 mutants, as measured using the Phsp-6::GFP reporter strains (Additional file 1: Figure S9A). However, we found that knocking down the expression of atfs-1 did not prevent sod-2 worms from developing to adulthood, or impact their longevity (Additional file 1: Figure S9B, C). This indicates that the mechanisms underlying longevity in sod-2 mutants are at least partially distinct from the long-lived mitochondrial mutants. The fact that knocking down atfs-1 during adulthood had little or no impact on lifespan suggests the possibility that ATFS-1 affects lifespan during development. Accordingly, we sought to determine whether knocking down atfs-1 levels only during development would be sufficient to decrease lifespan. To do this, we utilized an approach where worms are grown on atfs-1 RNAi during development and then transferred to RNAi against dicer (dcr-1) at adulthood [11, 12, 30]. By knocking down dicer, which is an essential component of the RNAi machinery, inhibition of atfs-1 expression should be prevented allowing atfs-1 levels to be restored. Worms were grown on empty vector or atfs-1 RNAi beginning at the L4 developmental stage of the parental generation and then transferred to either dcr-1 RNAi plates (to restore atfs-1 expression) or atfs-1 RNAi plates (to continue atfs-1 knockdown) at adulthood (Fig. 3a). Because atfs-1 is absolutely required in clk-1 and isp-1 worms for development to adulthood, we completed these experiments, and all of the remaining experiments in nuo-6 worms. We used quantitative real-time RT-PCR at day 2 of adulthood to examine the levels of dcr-1, atfs-1, and hsp-6. We found that transfer to dcr-1 RNAi plates at adulthood effectively decreased the expression of dcr-1 (Fig. 3b). The levels of atfs-1 were efficiently knocked down by atfs-1 RNAi and were significantly increased when transferred to dcr-1 RNAi (Fig. 3c). Importantly, treatment with atfs-1 RNAi during adulthood significantly reduced hsp-6 expression, while hsp-6 expression in worms grown on atfs-1 RNAi during development and transferred to dcr-1 RNAi at adulthood (atfs-1 ➔ dcr-1 paradigm) was equivalent to worms that were not treated with atfs-1 RNAi (EV ➔ dcr-1 paradigm) (Fig. 3d). Having shown that atfs-1 levels were being knocked down specifically during development, we next examined the resulting effect on lifespan. 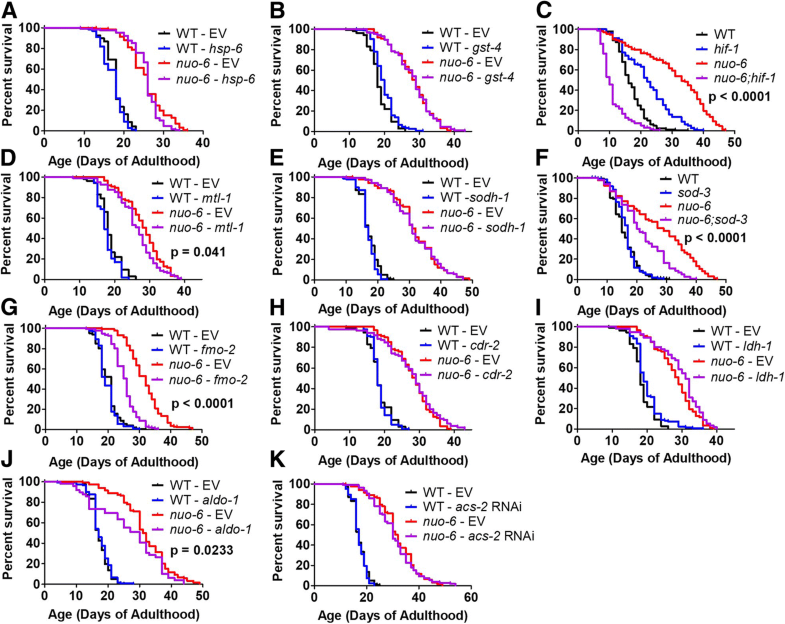 We found that knocking down atfs-1 expression during adulthood (EV ➔ atfs-1 paradigm) did not decrease the lifespan of nuo-6 worms (Fig. 3e). Similarly, decreasing atfs-1 expression during development alone (atfs-1 ➔ dcr-1 paradigm) was not sufficient to decrease nuo-6 lifespan (Fig. 3f). Note that the lifespan of nuo-6 worms treated with the atfs-1 ➔ dcr-1 paradigm showed significantly increased lifespan compared to worms treated with either the atfs-1 ➔ atfs-1 paradigm or atfs-1 ➔ EV paradigm (Additional file 1: Figure S10), providing further evidence that the transfer to dcr-1 RNAi was effective at restoring atfs-1 expression (continued knockdown of atfs-1 in atfs-1 ➔ EV paradigm leads to decrease in lifespan). Thus, in order for atfs-1 knockdown to decrease nuo-6 lifespan, atfs-1 levels had to be decreased during both development and adulthood. To begin to explore the mechanism by which loss of atfs-1 reduces the lifespan of nuo-6 worms, we compared physiologic rates and mitochondrial function in nuo-6 and nuo-6;atfs-1 worms. We found that the atfs-1 mutation increased both embryonic lethality and developmental arrest specifically in nuo-6 worms but not in wild-type worms (Fig. 4a, b). Of those worms that do develop to adulthood, atfs-1 mutants develop more slowly than wild-type worms, while nuo-6;atfs-1 worms reach adulthood in less time than nuo-6 worms (Fig. 4c). Loss of atfs-1 results in decreased brood size but does not further decrease the already low brood size of nuo-6 worms (Fig. 4d). Similarly, atfs-1 mutants have a slower thrashing rate than wild-type worms, but the mutation does not exacerbate the thrashing deficit present in nuo-6 mutants (Fig. 4e). The loss of atfs-1 results in a slower rate of defecation and decreased body length in both wild-type and nuo-6 worms (Fig. 4f, g). In examining mitochondrial function, we determined the rate of oxidative phosphorylation by measuring oxygen consumption per worm using an extracellular flux analyzer. We found that oxygen consumption per worm is decreased by the loss of atfs-1 in both wild-type worms and nuo-6 mutants (Fig. 4h). To determine if the rates of oxygen consumption resulted in altered levels of ATP, we used a lucigenin-based kit to measure ATP levels. We found that the atfs-1 mutation did not decrease ATP levels in wild-type or nuo-6 worms (Fig. 4i). To gain insight into the relationship between oxygen consumption and ATP levels, we examined the effect of the atfs-1 mutation on ROS levels in wild-type and nuo-6 worms. Consistent with the decreased levels of oxygen consumption, ROS levels as detected by dichlorofluorescein (DCF) fluorescence were significantly decreased by atfs-1 deletion (Additional file 1: Figure S11). Combined, these results show that disruption of atfs-1 negatively impacts worm physiologic rates and mitochondrial function, and this may at least partially explain the detrimental effect of the atfs-1 mutation on nuo-6 lifespan and the ability of clk-1 and isp-1 worms to develop to adulthood. Since the ability to resist multiple stresses has been associated with long life, we next examined the effect of the atfs-1 mutation on stress resistance in nuo-6 worms. Sensitivity to oxidative stress was assessed by exposing worms to 2 mM paraquat, a compound that acts to increase superoxide levels primarily in the mitochondria. We found that nuo-6 worms have increased survival compared to wild-type worms and that the atfs-1 mutation completely reverts their stress resistance to wild-type (Fig. 5a). atfs-1 mutants also exhibited a small decrease in oxidative stress resistance compared to wild-type worms. Sensitivity to osmotic stress was quantified by transferring worms to plates containing 550 mM NaCl (11X their normal salt concentration) and examining survival after 2 days. Again, we found that nuo-6 worms have increased resistance to osmotic stress, which was decreased in the presence of the atfs-1 mutation, and atfs-1 mutants had decreased survival compared to wild-type worms (Fig. 5b). In the heat stress assay, worms are exposed to 37 °C heat stress and survival is monitored hourly. nuo-6 worms exhibited a mildly increased resistance to heat stress (Fig. 5c). Loss of atfs-1 decreased the survival of both nuo-6 and wild-type worms during heat stress (Fig. 5c). Finally, we examined survival after 2 days of anoxia with a one-day recovery. We found that nuo-6 worms had an equivalent survival to wild-type and that in both cases survival was decreased by the atfs-1 mutation (Fig. 5d). Combined, these results indicate that ATFS-1 is important for survival against multiple forms of stress. The decrease in stress resistance in the nuo-6;atfs-1 double mutant may at least partially explain the decrease in longevity compared to nuo-6 mutants. To further explore the mechanism by which the loss of atfs-1 reduces the lifespan of nuo-6 worms, we compared gene expression in nuo-6 and nuo-6;atfs-1 mutants. We hypothesized that ATFS-1-mediated changes in gene expression contribute to the long life of nuo-6 worms. Accordingly, we examined the expression of genes involved in stress response or metabolism to identify genes that are modulated in nuo-6 worms and restored towards wild-type by the loss of atfs-1. In contrast to the ATFS-1-dependent activation of the mitoUPR (hsp-6), neither the endoplasmic reticulum unfolded protein response (hsp-4) nor the cytosolic protein response (hsp-16.2) is activated in nuo-6 worms (Fig. 6a–c). Interestingly, deletion of atfs-1 resulted in a marked activation of the cytosolic UPR as measured by increased hsp-16.2 expression. Preliminary exploration of this result indicated that upregulation of hsp-16.2 (and hsp-16.11) in atfs-1 mutants is dependent on the heat shock factor HSF-1 but independent of the FOXO transcription factor DAF-16 (Additional file 1: Figure S12) . To explore this relationship further, we generated atfs-1;hsf-1 double mutants. We found that atfs-1;hsf-1 double mutants are unhealthy as indicated by high sterility and low brood size. This suggests that the activation of the cytosolic UPR in atfs-1 mutants may be a compensatory response for the disruption of the mitoUPR. Examination of other stress response pathways revealed that the SKN-1-mediated stress response (gst-4), the HIF-1-mediated hypoxia response (nhr-57), and the DAF-16-mediated stress response (mtl-1, sodh-1, sod-3) are all activated in nuo-6 worms (Fig. 6d–h; Additional file 1: Figure S13), which may contribute to the increased resistance to stress we observed in nuo-6 mutants. In each case, loss of atfs-1 reduced the extent to which each stress response was activated, suggesting that activation of the mitoUPR can lead to the activation of other stress response pathways. Note that we and others have also observed the upregulation of the HIF-1 target nhr-57 in clk-1 and isp-1 mutants [27, 32, 33]. As ROS levels are elevated in nuo-6 mutants , and elevated ROS is sufficient to activate the HIF-1 pathway , it is likely that ROS are responsible for HIF-1 activation in nuo-6 worms. We also examined the expression levels of fmo-2, a flavin-containing monoxygenase involved in xenobiotic detoxification that was recently shown to modulate longevity , and cdr-2, a glutathione S-transferase also involved in xenobiotic detoxification and implicated in the longevity of isp-1 mutants . As with the other stress response genes, we observed increased expression in nuo-6 mutants that was significantly reduced by the loss of atfs-1 (Fig. 6i, j). Note that other antioxidant enzymes, including superoxide dismutases (sod-1, sod-2, sod-4, sod-5), catalases (ctl-1, ctl-2, ctl-3), and peroxiredoxins (prdx-2, prdx-6), with the exception of prdx-3, were not affected by loss of atfs-1 in wild-type or nuo-6 worms (Additional file 1: Figure S14). As nuo-6 mutants have been shown to have altered expression of metabolic genes , we examined the role of ATFS-1 in the expression of select metabolic genes. We selected genes that we had previously found to be increased in nuo-6 worms using RNAseq including lactate dehydrogenase (ldh-1), fructose biphosphate aldolase (aldo-1), glyceraldehyde 3-phosphate dehydrogenase (gpd-2), and fatty acyl-CoA synthetase (acs-2) . We found that all of these genes showed increased expression in nuo-6 worms that is dependent on atfs-1 (Fig. 6k–n). To examine the role of specific changes in gene expression induced by the mitoUPR in the long lifespan of nuo-6 mutants, we decreased the expression of genes that we found to be upregulated in nuo-6 mutants in an ATFS-1-dependent manner and measured lifespan. We decreased the expression of gst-4, mtl-1, sodh-1, fmo-2, cdr-2, ldh-1, aldo-1, and acs-2 using RNAi beginning at the L4 stage of the parental generation. For hsp-6, we begun RNAi treatment at the L4 stage of the experimental generation as hsp-6 RNAi can induce embryonic lethality . For sod-3, we used a genetic mutation rather than RNAi to avoid the possibility of knocking down its paralog sod-2, which could complicate the interpretation of the result since loss of sod-2 increases lifespan . We also used a genetic mutation for hif-1 so that we could compare the results to previous findings in clk-1 and isp-1 mutants . Note that conflicting results have been observed with respect to the longevity of the hif-1 mutant [39, 40]. We used conditions in which the hif-1 mutant is known to have an increased lifespan  such that any observed decrease in nuo-6 lifespan resulting from hif-1 mutation would be easier to interpret. We found that decreasing the expression of hsp-6, gst-4, sodh-1, cdr-2, and ldh-1 did not affect the survival of nuo-6 or wild-type worms (Fig. 7a, b, e, h, i). In contrast, we found that knockdown of mtl-1, fmo-2, or aldo-1 all significantly reduced nuo-6 longevity but had no effect on wild-type lifespan (Fig. 7d, g, j). Similarly, nuo-6;sod-3 and nuo-6;hif-1 double mutants exhibited decreased lifespan compared to nuo-6 mutants (Fig. 7c, f). Combined, this demonstrates that changes in the expression of stress response genes (hif-1, mtl-1, fmo-2, sod-3) and genes involved in metabolism (aldo-1) that are induced by ATFS-1 contribute to the longevity of nuo-6 mitochondrial mutants. Because the mutation in hif-1 completely abolished the lifespan increase present in nuo-6 worms such that nuo-6;hif-1 double mutants live shorter than wild-type worms (Fig. 7c), we decided to further explore the role of hif-1 in nuo-6 longevity. To do this, we used RNAseq to compare gene expression in nuo-6 and nuo-6;hif-1 mutants in order to identify genes that are modulated in nuo-6 worms and restored to wild-type by the hif-1 mutation, as these genes may contribute to the long life of nuo-6 worms. Using this approach, we found numerous upregulated or downregulated genes in nuo-6 worms that are HIF-1 dependent (Additional file 1: Figure S15). While it is beyond the scope of our current study to explore these targets in depth, our initial enrichment analyses identified genes involved in various types of metabolism as the top categories of upregulated genes that are reverted by the hif-1 mutation, while transport/trafficking genes are enriched among the downregulated genes (Additional file 1: Figures S16, S17). Because we observed an ATFS-1-dependent activation of three DAF-16 target genes in nuo-6 mutants, we decided to further explore the role of ATFS-1 in the activation of DAF-16 target genes. To do this, we examined the effect of the atfs-1 deletion on the nuclear localization of DAF-16 using a DAF-16 translational reporter strain (zIs356[Pdaf-16::daf-16:GFP]) . We found that in atfs-1 deletion mutants, the nuclear localization of DAF-16 in response to 35 °C heat stress was significantly slowed (Additional file 1: Figure S18), suggesting that ATFS-1 can facilitate nuclear localization of DAF-16. Since loss of ATFS-1 affected the nuclear localization of DAF-16, we next wondered the extent to which activation of ATFS-1 caused modulation of DAF-16 target genes. We had previously shown that the transcriptional changes present in nuo-6 mutants exhibit a significant overlap with daf-2 mutants and a significant enrichment of DAF-16 target genes and that DAF-16 is required for the long lifespan of nuo-6 mutants . To more directly assess the role of ATFS-1 in modulation of DAF-16 target genes, we used RNAseq to examine gene expression in two atfs-1 gain-of-function mutants. These two mutant, atfs-1(et15) and atfs-1(et17), have point mutations affecting the mitochondrial targeting sequence, which results in cytoplasmic accumulation of ATFS-1 allowing ATFS-1 to enter the nucleus and activate its transcriptional targets . 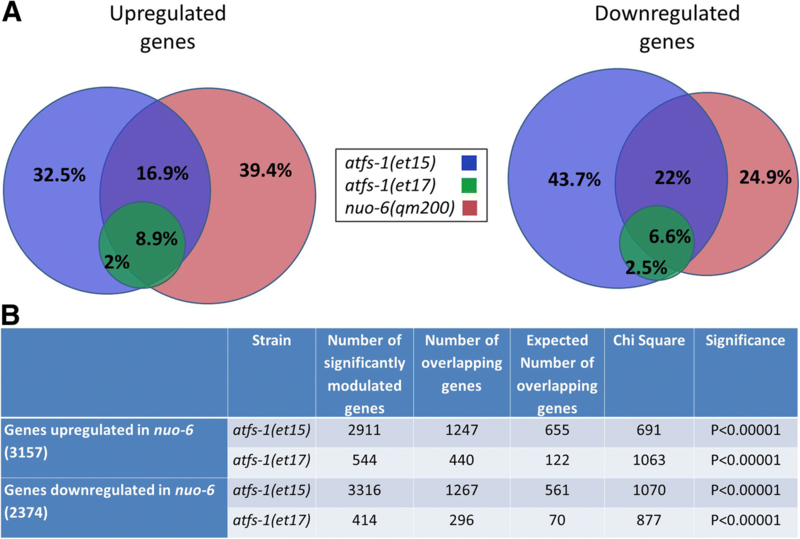 We found that the upregulated and downregulated genes in the atfs-1 gain-of-function mutants exhibited a significant degree of overlap with daf-2(e1370) mutants (Fig. 8a, Additional file 1: Table S1). In addition, many of the top upregulated and downregulated DAF-16 target genes determined by a meta-analysis of daf-16 expression data  were similarly modulated in the atfs-1 gain-of-function mutants (Fig. 8b). 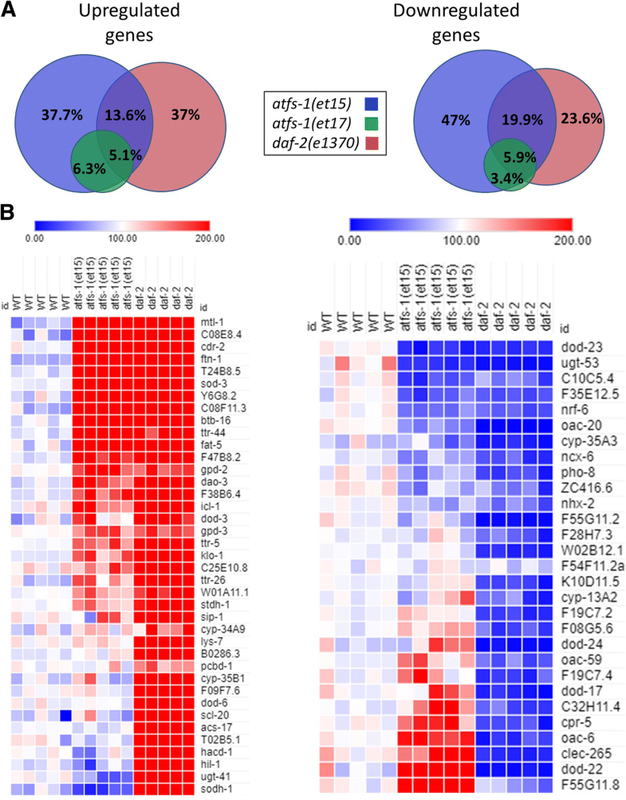 While further studies will be required to explore the molecular mechanisms, these results suggest that ATFS-1 can affect DAF-16 target genes at least partially through the nuclear localization of DAF-16. Because we identified multiple ATFS-1-dependent changes in gene expression in nuo-6 worms that contributed to longevity, we decided to use RNAseq to gain a more comprehensive view of which transcriptional changes in nuo-6 mutants are ATFS-1 dependent (see Additional file 2: Table S2 for differentially expressed genes). We identified many genes that were upregulated or downregulated in nuo-6 worms and restored to wild-type by the atfs-1 deletion (Additional file 1: Figure S19). While further studies will be required to assess the contribution of these genes to nuo-6 longevity, our initial enrichment analysis shows that genes involved in metabolism of lipids are the most enriched upregulated gene class that is dependent on ATFS-1, while genes involved in the metabolism of RNA are the most enriched downregulated gene class that is ATFS-1 dependent (Additional file 1: Figures S20, S21). Congruent with our results showing a role for ATFS-1 is stress resistance, resistance to stress was one of the GO terms identified for ATFS-1-dependent upregulated genes in nuo-6 mutants (Additional file 3: Table S3). Having shown that nuo-6 worms exhibit activation of the mitoUPR and a large number of ATFS-1-dependent changes in gene expression, we compared the gene expression of nuo-6 mutants to the atfs-1 gain-of-function mutants, atfs-1(et15) and atfs-1(et17). We found that there is a highly significant degree of overlap between nuo-6 mutants and the atfs-1 gain-of-function mutants (Fig. 9). We also observed a highly significant degree of overlap between both clk-1 mutants and isp-1 mutants and the atfs-1 gain-of-function mutants (Additional file 1: Figures S22, S23). Combined, this suggests that a large proportion of transcriptional changes in the long-lived mitochondrial mutants are caused by activation of ATFS-1. The mitochondrial gene mutations clk-1, isp-1, and nuo-6 affect the function of the electron transport chain, leading to increased longevity [19–22]. Since the activation of the mitoUPR improves protein homeostasis in the mitochondria, it is plausible that this activation could improve longevity. While it has been clearly demonstrated that activation of the mitoUPR is not sufficient to increase lifespan , contribution of the mitoUPR to the longevity of specific long-lived mutants or RNAi-treated worms has been debated [12, 16]. In our current study, we provide resolution to these differing results by using multiple paradigms, exploring the role of the mitoUPR at different developmental stages, and measuring the precise levels of knockdown for each condition. By knocking down atfs-1 levels specifically during adulthood, we show that ATFS-1 is not required during adulthood for the longevity of clk-1, isp-1, or nuo-6 worms. Assessing the role of ATFS-1 and the mitoUPR during development in the longevity of the long-lived mitochondrial mutants is more complicated and has likely lead to the differing views of previous publications. Our results suggest that if atfs-1 levels are knocked down sufficiently, it is not possible to fully assess the role of ATFS-1 in the lifespan of clk-1 and isp-1 worms because atfs-1 is required for these worms to develop to adulthood (atfs-1 RNAi beginning in the parental generation or atfs-1 deletion both resulted in developmental arrest). Thus, when testing the role of ATFS-1 in longevity, our results suggest that it is essential to quantify the extent of knockdown using RNAi or to use a null mutant. The fact that nuo-6;atfs-1 mutants are able to develop to adulthood provided us with the opportunity to assess the role of atfs-1 in the longevity of a long-lived mitochondrial mutant. We found that a deletion of atfs-1 reverts the lifespan of nuo-6 worms back to wild-type lifespan, while atfs-1 RNAi beginning in the parental generation markedly decreases nuo-6 lifespan. Combined, our results demonstrate that atfs-1 performs an essential role during development which allows clk-1 and isp-1 worms to reach adulthood; however, once these worms reach adulthood, atfs-1 is expendable with respect to longevity. Unlike clk-1 and isp-1 mutants, nuo-6 worms are able to tolerate the absence of atfs-1 during development, but atfs-1 is required for their long lifespan. The mitoUPR is activated by stresses that disrupt protein folding or stoichiometry in the mitochondria [2, 5, 6]. While a role for ATFS-1 was previously demonstrated in resistance to bacterial pathogens and anoxia [45, 46], our work demonstrates that the mitoUPR has a much broader impact on resistance to multiple forms of stress. Despite the fact that we have previously shown that the mitoUPR, as measured using the Phsp-6::GFP reporter strain , is activated by oxidative stress but not heat, cold, osmotic, anoxic, starvation, ER or bacterial pathogen stress , the loss of the mitoUPR results in increased sensitivity to multiple stresses. Deletion of atfs-1 increased sensitivity to oxidative, osmotic, heat, and anoxic stress in both wild-type and nuo-6 worms. The mechanism by which ATFS-1 modulates stress resistance is likely through the upregulation of stress response pathways, as we show that deletion of atfs-1 prevents the upregulation of target genes of the HIF-1-mediated hypoxia response (nhr-57), the SKN-1-mediated oxidative stress response (gst-4), the DAF-16-mediated stress response (mtl-1, sodh-1, sod-3), and genes involved in xenobiotic detoxification (fmo-2, cdr-2) in nuo-6 worms. Combined, our results suggest that activation of the mitoUPR causes an ATFS-1-dependent increase in the expression of stress response genes from multiple pathways leading to an increased stress resistance. In examining the effect of atfs-1 deletion on the expression of genes involved in known stress response pathways, we observed a dramatic upregulation of hsp-16.11 and hsp-16.2, two genes involved in the cytosolic unfolded protein response (cytoUPR), but no effect on the expression of hsp-4, which is involved in the ER unfolded protein response (ER-UPR). We also found that knocking down other proteins involved in the mitoUPR, including ubl-5 and dve-1, resulted in upregulation of the cytosolic unfolded protein response target genes. Similarly, hsp-16.2 was also found to be upregulated when the atfs-1 target gene hsp-6 was knocked down through a mechanism involving lipid biosynthesis . In contrast, we found that knockdown of haf-1 did not affect hsp-16.11 or hsp-16.2 expression. Although heat stress has been shown to activate the unfolded protein response in multiple compartments of the cell, many stresses activate only one of the mitoUPR, cytoUPR, or ER-UPR . Consistent with this observation, nuo-6 mutants, which exhibit activation of the mitoUPR (as measured by hsp-6 reporter and expression), show decreased expression of genes involved in the cytoUPR (hsp-16.2) and ER-UPR (hsp-4). The fact that the cytoUPR is activated when atfs-1 is knocked down suggests that there may be communication between the mitoUPR and cytoUPR to protect the cytoplasm from potential detrimental effects of a defective mitoUPR. This conclusion is supported by our data showing that blocking the cytoUPR in mitoUPR-deficient atfs-1 mutants leads to a general decline in worm health. It is also supported by work showing that decreasing the levels of a mitochondrial protein, cytochrome c oxidase (F29C4.2), causes both an ATFS-1-dependent activation of the mitoUPR and delays the age-associated decline of the cytoUPR in an HSF-1-dependent manner . Combined, these results suggest that the mitoUPR and cytoUPR work together to maintain proteostasis in the cell. In this work, we show that nuo-6 worms exhibit increased resistance to multiple forms of stress, and upregulation of genes involved in multiple stress response pathways including the SKN-1-mediated oxidative stress response (gst-4), HIF-1-mediated hypoxia response (nhr-57), DAF-16-mediated stress response (mtl-1, sodh-1, sod-3), and xenobiotic detoxification genes (fmo-2, cdr-2). 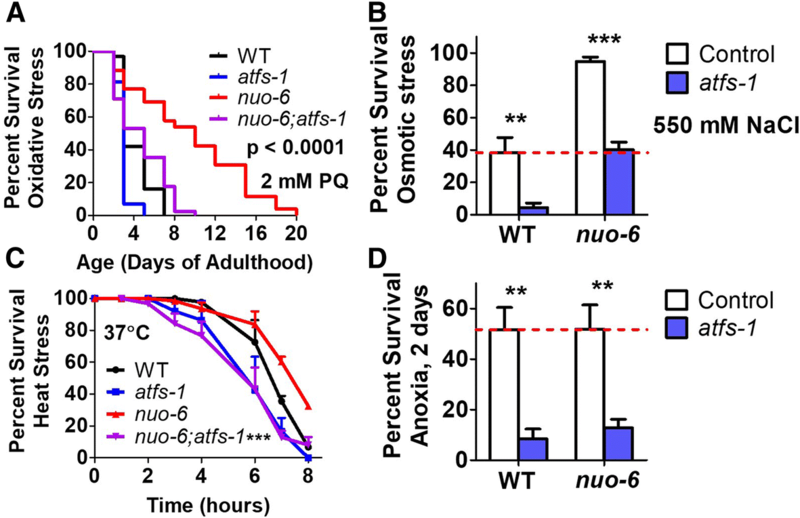 The upregulation of all of these stress response genes requires atfs-1 suggesting that the mechanism by which atfs-1 promotes longevity in nuo-6 worms may be at least partially mediated by increasing resistance to stress. Accordingly, we assessed the contribution of individual ATFS-1-modulated genes or pathways to nuo-6 lifespan. The loss of the hypoxia inducible factor hif-1 had the greatest impact on nuo-6 lifespan as nuo-6;hif-1 double mutants live shorter than wild-type worms. As it has previously been reported that hif-1 is required for the longevity of clk-1 and isp-1 mutants , and multiple genes involved in the HIF-1-mediated hypoxia response have been shown to be upregulated in isp-1 worms , this suggests that the hypoxia response pathway may be a common mediator of longevity among multiple mitochondrial mutants. The second largest impact on nuo-6 lifespan that we observed resulted from the knockdown of the Flavin-containing monooxygenase fmo-2. This gene has also been shown to be required for the increased lifespan of vhl-1 mutants, which have constitutive activation of the hypoxia response, and the long lifespan resulting from dietary restriction on solid plates . Combined, this suggests that fmo-2 may be a common downstream effector of multiple pathways of lifespan extension. The loss of sod-3, the inducible mitochondrial sod gene, also markedly decreased nuo-6 lifespan, despite the fact that sod-3 expression normally accounts for less than 1% of total sod mRNA, and accounts for less than 8% of sod mRNA in nuo-6 worms. We have previously shown that sod-3 is also required for the long lifespan of isp-1 mutants , but is expendable for clk-1 and wild-type lifespan [28, 29, 32]. The increased dependence of nuo-6 and isp-1 worms on sod-3 expression may stem from the fact that clk-1 worms show a more widespread upregulation of antioxidant defense genes , than isp-1  or nuo-6 mutants. The ATFS-1 transcription factor, which mediates the mitoUPR, is required for the development and lifespan of the long-lived mitochondrial mutants, but is dispensable during adulthood. Our results demonstrate a novel role for ATFS-1 in resistance to stress and suggest that the mechanism by which ATFS-1 modulates longevity in nuo-6 worms is through the activation stress response pathways. Strains were maintained on nematode growth medium (NGM) plates at 20 °C with OP50 E. coli bacteria as the food source. All experiments were performed using live bacteria. The following strains were utilized in this study: wild-type (N2 Bristol), clk-1(qm30), isp-1(qm150), nuo-6(qm200), sod-2(ok1030), sod-3(tm760), fmo-2(ok2147), atfs-1(gk3094), atfs-1(et15), atfs-1(et17), hsf-1(sy441), daf-16(mu86), hif-1(ia4), zcIs13[Phsp-6::GFP], dvIs19[Pgst-4::GFP], iaIs7[Pnhr-57::GFP], muIs84[Psod-3::GFP], zIs356[Pdaf-16::daf-16:GFP], nuo-6(qm200);atfs-1(gk3094), clk-1(qm30);zcIs13[Phsp-6::GFP], isp-1(qm150);zcIs13[Phsp-6::GFP], nuo-6(qm200);zcIs13[Phsp-6::GFP], nuo-6(qm200);dvIs19[Pgst-4::GFP], nuo-6(qm200);muIs84[Psod-3::GFP], nuo-6(qm200);sod-3(tm760), nuo-6(qm200);fmo-2(ok2147), nuo-6(qm200);hif-1(ia4), atfs-1(gk3094);hsf-1(sy441), atfs-1(gk3094);daf-16(mu86), atfs-1(gk3094); zIs356[Pdaf-16::daf-16:GFP]. Double mutants were generated as described  and confirmed in two consecutive generations. atfs-1(gk3094) is an 881 base pair deletion beginning in exon 3 that is predicted to result in a frameshift that would affect the leucine zipper domain and nuclear localization signal at the C-terminus of the protein. Thus, it is likely that gk3094 is a null allele. Adult worms were immobilized using 20 mM sodium azide, arranged into a group of 8 worms and imaged using VimbaViewer 1.1.2 software and an AVT Stingray F145B camera connected to a Nikon SMZ1500 microscope. Quantification of fluorescence was performed using ImageJ software to measure integrated density in whole individual worms. Three replicates of 8 worms each were examined. Quantification of fluorescent reporter strains during larval development was performed in liquid in a 96-well dish using a Cellomics Arrayscan high content imager . Biological replicates were performed on different days from distinct populations of worms. Nuclear localization of DAF-16 was visualized using a reporter strain in which daf-16 is fused to GFP: TJ356 zIs356 [Pdaf-16::daf-16a/b:GFP+rol-6(su1006)] . Worms were exposed to a mild heat stress at 35 °C for 30 min on 60 mm NGM plates and then immobilized using levamisole on an unseeded NGM plate prior to visualization using a Nikon SMZ1500 fluorescence dissecting microscope. RNAi clones picked from the Ahringer RNAi library were sequenced to confirm that they target the correct gene. RNAi plates containing 50 μM carbenicillin and 3 mM IPTG were seeded with 150 μL of 5× concentrated RNAi bacteria that were grown for less than 12 h in LB media containing 50 μM carbenicillin. Plates were allowed to sit for 2 days to allow for bacterial growth and induction of RNAi construct before transferring worms onto the plates. Plates were made fresh weekly and plates that were not used immediately were stored in a 4 °C cold room. Two different RNAi paradigms were utilized to avoid detrimental effects of gene knockdown during development. In the L4 parental paradigm, worms are transferred to RNAi plates at the L4 stage of development. When the worms become gravid adults, they are transferred to a second RNAi plate and allowed to lay eggs for 1 day. Experiments are then performed on the F1 progeny. In the L4 direct paradigm, the experimental animals are transferred to RNAi plates at the L4 stage of development and experiments are performed directly on these animals. Lifespan assays were performed at 20 °C on plates containing FUdR. In most cases, we used 25 μM FUdR as this concentration was shown to have minimal effects on longevity while effectively preventing the development of progeny on the second lifespan plate . For experiments involving clk-1, we used 100 μM FUdR as these worms tend to have a high rate of non-aging related pathologies at lower concentrations of FUdR. Lifespan was performed in a blinded manner by three independent researchers. Worms were transferred to fresh plates weekly. Worms were removed from the experiment if they died of unnatural causes including desiccation on the side of the dish, internal hatching of progeny (bagging) or expulsion of internal organs. Lifespan data is provided in Additional file 4: Table S4. RNA was isolated from synchronized populations on pre-fertile young adult worms using TRIZOL as previously described . RNA was isolated from a plate of synchronized worms containing approximately 1000 worms. For quantitative real-time RT-PCR, mRNA was converted to cDNA using a High Capacity cDNA Reverse Transcription Kit (Life Technologies) according to the manufacturer’s protocol. qPCR was performed in an AP Biosystems RT-PCR machine using a FastStart Universal SYBR Green kit (Roche). mRNA levels from at least three biological replicates collected on different days were normalized to the levels of act-3 and then expressed as a percentage of wild-type. RNA sequencing (RNAseq) data will be publicly available at GEO: GSE110984. RNA sequencing and analysis was performed as described previously . For RNAseq experiments, we collected at least three independent samples for all genotypes. RNA was isolated independently for all samples. Sequencing libraries were prepared from 500 ng of total RNA using the Kapa Biosystems stranded mRNA-seq kit for the Illumina platform. Libraries were pooled equimolarly and sequenced to a minimum depth of 30 M reads using 1 × 75 bp sequencing on the Illumina NextSeq 500 platform at the Van Andel Research Institute. Read quality was assessed using FastQC v. 0.11.5 (http://www.bioinformatics.babraham.ac.uk/projects/fastqc/) and one-pass aligned to WBcel235 C. elegans genome using STAR v. 2.5.2b  with default parameters and “--outReadsUnmapped None”. The STAR genome index was generated with the corresponding Ensembl WBcel235 build 89 GTF annotations integrated. Transcript abundances were quantified using the --quantMode GeneCounts option enabled during alignment. Differential gene expression analysis was performed using the quasi-likelihood framework in edgeR v. 3.20.2  in R v. 3.4.1, adjusting for sequencing batch in the model. Gene names, gene IDs, and predicted function annotations were downloaded using the biomaRt package v. 2.34.2. Gene ontology enrichment was performed with the GOseq package v. 1.30.0 . Reactome enrichment was performed using the ReactomePA package v. 1.22.0 reactome . Venn diagrams of overlapping genes were generated using the free online tool BioVenn: http://www.biovenn.nl/. Heat maps were generated using the free online tool from the Broad Institute Morpheus: (https://software.broadinstitute.org/morpheus/). Embryonic lethality was measured by allowing worms to lay eggs for a period of 2–4 h. After 2 days, the number of unhatched eggs and live worms were counted to determine embryonic lethality. Post-embryonic development time was measured by picking 100–300 eggs to a new plate. After 3 h, 25 newly hatched L1 worms were transferred to a new plate. Development to adulthood was checked every 4 h beginning at 36 h. Worms that failed to develop to adulthood during the post-embryonic development time assay were recorded to quantify developmental arrest. Brood size was determined by transferring L4 worms to individual plates. Worms were then transferred daily when progeny production began. When progeny grew to adulthood, plates were stored at 4 °C to immobilize worms prior to counting offspring. Thrashing rate was manually counted by transferring 20 pre-fertile young adult worms to an NGM plate without bacteria. One milliliter of M9 buffer was then added to the plate and the number of body bends per 30 s was counted. Defecation cycle length was counted as the time between two consecutive pBoc contractions. Worms were plated on NGM plates completely covered in bacteria at the L4 stage of development and defecation was measured the following day. Body length was determined by anesthetized worms with 10 mM sodium azide, imaging worms and using ImageJ to determine length compared to a calibration ruler. Oxygen consumption rate was measured using a Seahorse XFe96 analyzer (Seahorse bioscience Inc., North Billerica, MA, USA) . Day 1 adult worms were washed in M9 buffer and transferred into a Seahorse 96-well plate containing 175 μL Seahorse calibrant. Oxygen consumption was measured in five biological replicates, each of which included 5 technical replicates, all at room temperature. Each replicate included approximately 20 worms. Oxygen consumption was normalized per worm rather than per milligram protein. By using the extracellular flux analyzer, we were able to quantify the exact numbers of worms present and to perform more replicates than would be possible by traditional Clarke electrode approaches. However, in order to prevent overcrowding, the number of worms utilized per well in the extracellular flux analyzer is too low to get an accurate measurement of protein. To measure ATP levels, approximately 200 worms were age-synchronized by transferring daily. Worms were collected in de-ionized water, washed, and freeze-thawed three times. The resulting pellet was sonicated in a Bioruptor (Diagenode) with 30 cycles of 30 s on and 30 s off. The pellet was boiled for 15 min to release ATP, then spun at 4° at 11,000g for 10 min. The supernatant was collected and measured using a Molecular Probes ATP determination Kit (Life Technologies). Luminescence was normalized to protein content, which was measured with a Pierce BCA protein determination kit (Thermo Scientific). Statistical analysis was performed using GraphPad software. To assess mitochondrial morphology, worms were crossed to Pmyo-2::mito-GFP worms and age-synchronized by transferring daily. For imaging, worms were transferred to an agar pad mounted on a slide. Worms were subsequently paralyzed with 10 μM levamisole and cover-slipped. Images were captured by confocal microscopy (Nikon A1R Ti) at 60×. Images were processed and analyzed using Nikon Elements Basic Research software. Background was subtracted and GFP was thresholded at a constant for all images. We found that the atfs-1 mutation inhibited the correct localization of GFP to the mitochondria , and thus we were unable to examine mitochondrial morphology using this approach. To measure the levels of ROS, we used the ROS-sensitive dye dichlorofluorescein (DCF) based on a published protocol . Fifty L1 worms per well were incubated in 25 μM DCF for 2 h. Each strain was measured six times. As a positive control, worms were treated with 5 mM of the ROS-generating compound paraquat. Fluorescence was measured every 10 min for an hour using a plate reader. Sensitivity to heat stress was assessed by transferring worms to 37 °C and monitoring survival hourly. Sensitivity to oxidative stress was measured by transferring worms to plates containing 2 mM paraquat. These plates also contained 100 μM FUdR to prevent internal hatching of progeny, which can be caused by treatment with paraquat. Sensitivity to osmotic stress was assessed by transferring worms to NGM plates containing 550 mM NaCl and testing survival after 2 days. Sensitivity to anoxia was assessed using a BD Bio-Bag Type A environmental chamber (Becton, Dikinson and Company, NJ) according the manufacturer’s directions. Worms were placed under anoxic conditions for 54 h and allowed 24 h under normoxia to recover before scoring survival. Three replicates of at least 20 worms per replicate were performed. Statistical analysis was performed using GraphPad Prism version 5.01. Statistical significance of survival data was determined using the log-rank test. Experiments involving a time course were analyzed using a repeated measures ANOVA. The remaining experiments were analyzed using one-way or two-way ANOVA depending on the number of groups and outcomes. To determine which genes from the RNAseq data are significantly modulated, we used the quasi-likelihood framework in edgeR package v. 3.20.1  in R v. 3.4.1. To assess the significance of overlapping genes between two strains, we used Chi square tests to determine if the number of overlapping upregulated or downregulated genes between the two strains was significantly greater than what would be expected by chance. Error bars indicate standard error of the mean. *p < 0.05, **p < 0.01, ***p < 0.001. For additional details on N for each experiment, please see Additional file 5: Table S5. Ziyun Wu and Megan M. Senchuk contributed equally to this work. Some strains were provided by the CGC, which is funded by NIH Office of Research Infrastructure Programs (P40 OD010440). We would like to thank Mary Rhodes and Marie Adams from the VARI Genomics Core Facility for library preparation and RNA sequencing. We would also like to acknowledge the C. elegans knockout consortium and the National Bioresource Project of Japan for providing strains used in this research. This work was supported by the National Institute of General Medical Sciences (NIGMS) by grant number R01 GM121756 (PI: Jeremy Van Raamsdonk) and the Van Andel Research Institute (VARI). TKB and ZW were supported by the NIH (R35 GM122610 and R01 AG054215). The funders had no role in design or analysis of the study. RNAseq data has been deposited on GEO: GSE110984. All other data and strains generated in the current study are available from the corresponding author on request. JVR is responsible for the conceptualization; ZW, MMS, BKJ, TKB, and JVR are responsible for the methodology; JVR is responsible for the validation; ZW, MMS, BKJ, JFC, TKB, and JVR are responsible for the formal analysis; ZW, MMS, DJD, BKJ, JFC, LL, EM, CES, and HD are responsible for the investigation; JVR is responsible for the writing—original draft; ZW, MMS, DJD, BKJ, JFC, LL, EM, CES, HD, and TKB are responsible for the writing—reviewing and editing; ZW, MMS, BKJ, and JVR are responsible for the visualization; MMS, JFC, EM, TKB, and JVR are responsible for the supervision; JVR is responsible for the project administration; JVR and TKB are responsible for the funding acquisition. All authors read and approved the final manuscript.